This week, University of Redlands President Ralph W. Kuncl wrote to the community about two events: Saturday’s tragic shooting at the Tree of Life Synagogue in Pittsburgh, where a U of R student lost her grandparents, and the rapidly approaching election on Tuesday, November 6. Here are excerpts from his communications. This weekend, Redlands, California seems not very far from Pittsburgh, Pennsylvania. One of our students lost her grandparents in the massacre of 11 worshipers at the Tree of Life Synagogue in that eastern city on Saturday. On behalf of our community, to our student, to those injured—including four police officers—and to all of the families who lost loved ones in this heinous, discrimination-fueled act of ethnoreligious violence, I send our deepest feelings of condolence. We are hurt, caring, and concerned. Pittsburgh’s Mayor Bill Peduto called Saturday “the darkest day of Pittsburgh’s history.” Yet, it feels like just one more dark day among so many that our nation is experiencing. We feel whipsawed between stories ranging from ominous to outrageous to inconceivable. The themes of the past week seem to have been of exclusion, just the opposite of our University community’s values of inclusiveness, equity, and justice: that is, national, cultural, and political divisiveness; racial supremacy and outright hate; and now – yet again – gun violence on a mass scale. From domestic terrorism in the form of mail-bomb threats, to another massacre in a place of worship – with the innocent dead this time including close family members of one of our own – we ache with sadness. It is easy in such times to feel helpless, angry, confused—even fearful—as we watch the news unfold. But, I urge us to take to heart what Mayor Peduto also said this weekend: “We know that we as a society are better than this.” This is an expression of hope that we can alter the future. Ever since our nation’s founding, an educated, voting citizenry is expected to do so. Members of our faculty, students, and staff have already been collaborating to increase both voter registration and turnout, whether for students who are registered locally, in their hometowns in California, or in other states, or for others in our community. I commend these efforts by Professors Jennifer Tilton and Steve Wuhs, the Associated Students of the University of Redlands, and the Office of Community Service Learning, alongside various student volunteers. I remember like it was yesterday the first time I could vote. On Tuesday, November 6, many undergraduates will also be fulfilling for the very first time in their lives a primary right and responsibility of our citizenship as Americans: the right to vote. Still many more of us will be exercising this civic duty yet again, as we do at this time every election year and have done for many decades—for we take the right, the responsibility, and the duty very seriously. We know we’ll have the opportunity to help make key decisions about our cities, our states, and our country in these midterm elections. Here in California, we will elect a new Governor, choose Congressional representatives, and decide on important propositions. Members of the University of Redlands community, committed as we are to promoting a culture of civic learning and democratic engagement, know better than most the precious value of each and every vote. Collectively, we have the potential to influence our government in a real and tangible way. As I wrote last weekend following the events in Pittsburgh, it is easy in these times to feel helpless. But I also said that I believe change is possible. More than that, I’d like you to encourage your friends and family to vote, too. As educators and students, it is our civic responsibility to boost the participation of the electorate. It is, after all, impossible to create a representative democracy without a representative vote. 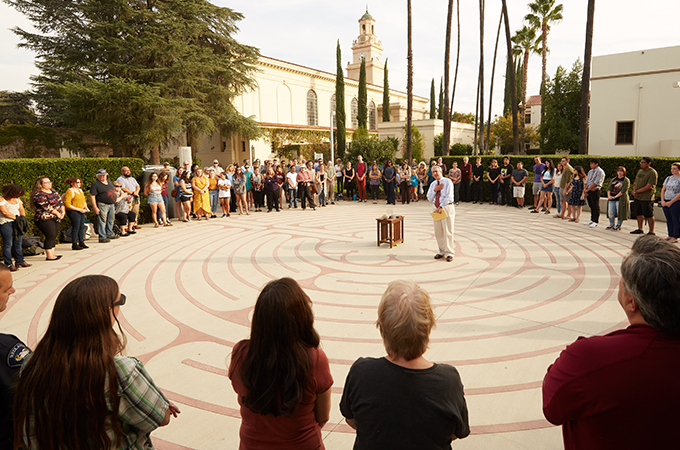 We say our guiding mission here at the University of Redlands is to “develop responsible citizenship as part of a complete education.” Although responsible citizenship may start with our vote, it doesn’t end there. Our engagement in the world is a powerful tool in helping others to embrace new ideas. Thinking critically and ethically will help foster a better understanding of society’s differences. I encourage us to keep freely exchanging our individual perspectives and engaging conversations about the contemporary issues that are most important. If you haven’t yet mailed in your ballot, or will head to the polls on Tuesday but are still making your decisions on the candidates and issues, here are some nonpartisan sources to help guide your decisions. Join me in casting your ballot on November 6. Please. Let us create our future.